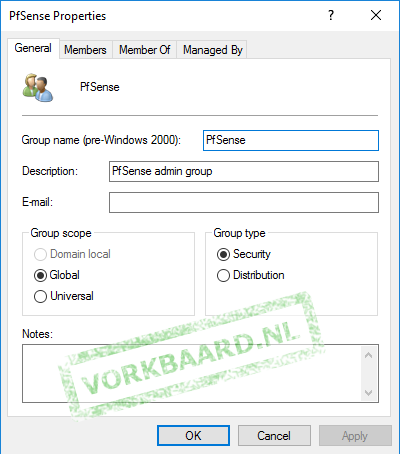 You can assign an Active Directory group to log in to PfSense’s web interface. This article has a more elaborate discussion of two different methods to achieve an Active Directory link, here I’ll just describe the LDAP one. RADIUS will work as well. 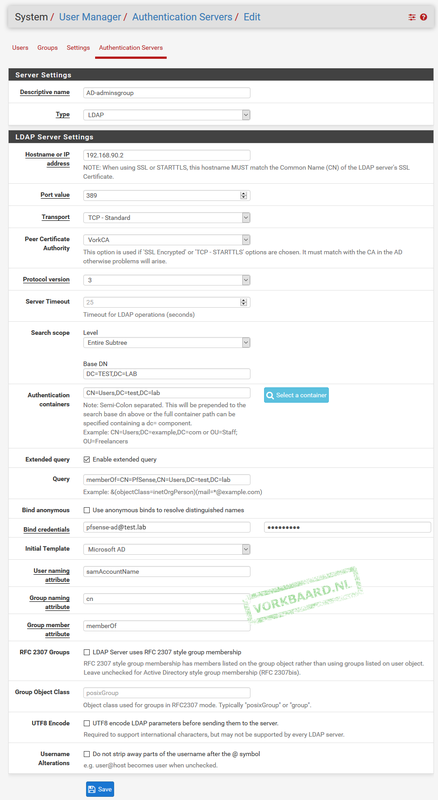 – Create a PfSense group and add users who should be allowed to log in to PfSense. 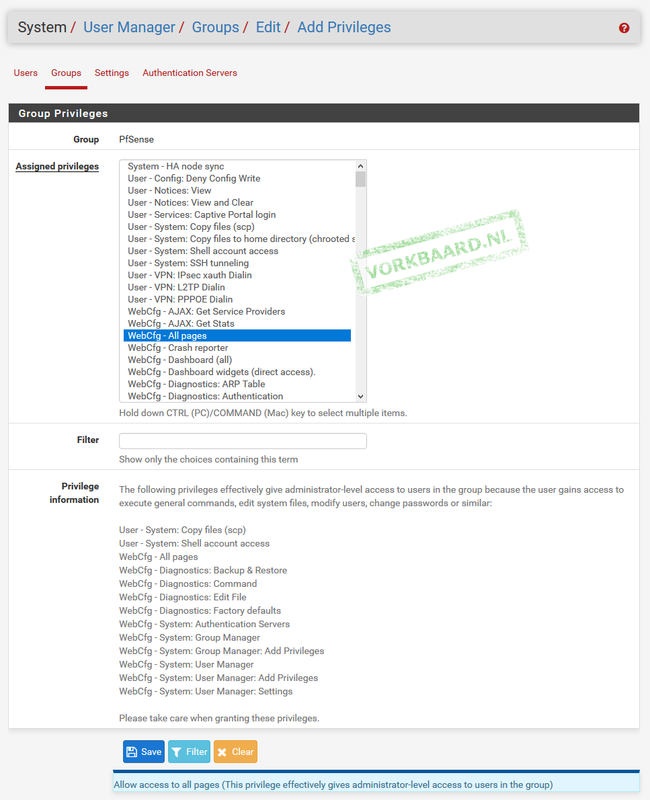 – Create a dedicated account for PfSense to connect to AD with, for example ‘pfsense-ad’. Give the account a hard password, set it to never expire and do not make it a member of any particular groups. This account is only used to establish the connection to Active Directory, not to perform the actual authentication. 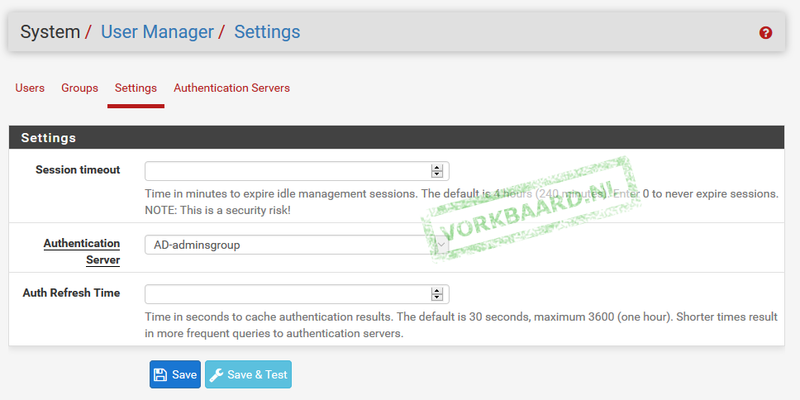 Define an Authentication Server: go to System > User Manager Authentication Servers and click Add. Add the AD group to PfSense: go to System > User Manager > Groups and click Add. Click Save, then click the Edit icon for the group you just created and click Add. Select WebCfg – All pages (or any other pages you want to assign – ‘WebCfg – All pages’ gives admin access) and click Save. Point the User Manager to the new Authentication Server: go to System > User Manager > Settings and set Authentication Server to AD-adminsgroup (the Authentication Server you just created). 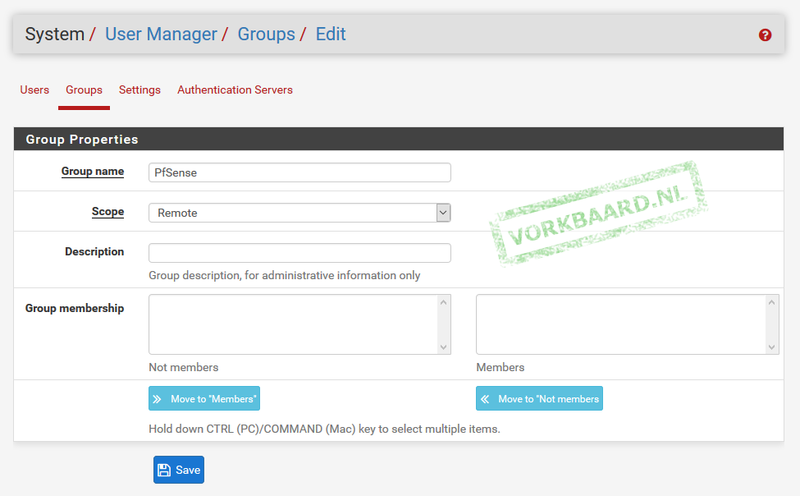 Now you can log into the PfSense web interface with your AD account if you are a member of the right group. Troubleshoot with Diagnostics > Authentication if necessary. 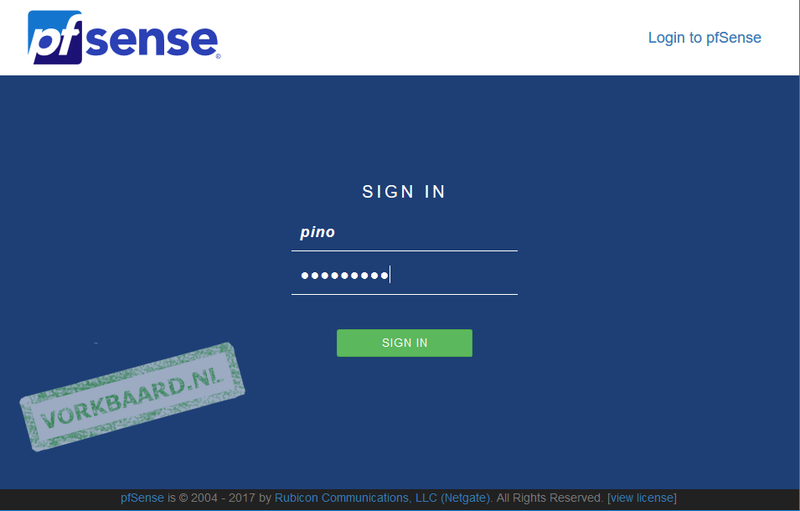 – Log in using just the username part, without the domain name – for example just pino, not test\pino or pino@test.lab. – You can still log in with the old admin account. – For nested groups replace “memberOf” with “memberOf:1.2.840.113556.1.4.1941:” in the LDAP query. – If you can’t log in and the log out link doesn’t work use your browser’s privacy mode or a different browser or computer altogether to log in to PfSense using the old admin account and troubleshoot. Thanks for the post. I followed every step and did not work so I looked it over and noticed you have Cert Authority defined but I do not have any Cert Authority. Would this be a problem? thanks for your post, can you please post a topic how connect Freeradius package on pfsense to Microsoft AD via LDAP ? Even if it is possible, why would you do that and not just connect directly to AD? Which versions are you using? Perhaps the new Nextcloud/OwnCloud version is doing thing differently. Otherwise just start over. I’ve seen this a few times: you are certain it should work but it just doesn’t. hi, thanks for all the help given, I have a doubt with the authenticated proxy, could you make a post? Hello, thanks for the information published. My question is about pfsense proxy authentication. Can you establish proxy filtering by Active Directory users? Not sure what you mean by proxy filtering. You either authenticat through AD or PfSense. Closest I can think of is radius.